The theme of this week's kitchen adventures has revolved entirely around easy and fun Halloween treats (secondary theme- becoming the Michelin Man for next Friday's costume....because after eating all these sweets that is exactly what I will look like). 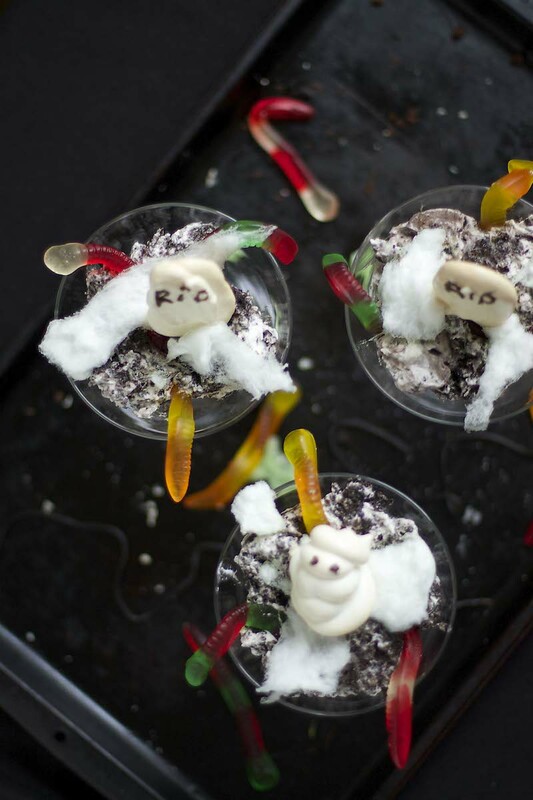 The first "spooky" treats are these haunted dirt cakes. Wait, don't run away. They're only haunted with dreams of 6-pack abs, vegetables left untouched, and forgotten workout clothes. They aren't actually haunted. I never know if you guys know not to take me seriously like ever so I thought it best to clarify. Moving right along....So dirt cakes. Everyone loves them because it's basically cookies, cream and chocolate and who doesn't love those things?! And if everyone doesn't love them, well, more for you (or me)! This recipe is a bit different than the one I used for the edible flower dirt cakes, but it's still just as tasty. Also, this recipe doubles or triples really well in case you're having a Halloween party (or just a party of one, either is fine by me). Hope you all have a great weekend! If you need me, I'll be hiding out on a beach drinking away the fact that I'm in a swimsuit after a week of dessert recipe testing...oy vey! For the "dirt"- In a cuisinart, pulse the Oreos for about 10 seconds. Add in the cream cheese and continue pulsing until the ingredients have combined. Make sure not to pulse too long or the mixture will form together and become pasty. Also, the cookie pieces should be somewhat chunky and not too fine. In a separate bowl, whip the cream until it forms soft peaks. This should equal about 2 cups of whipped cream. Gently fold the cookie mixture into the cream mixture until combined. To serve- Scoop the dirt into serving dishes. 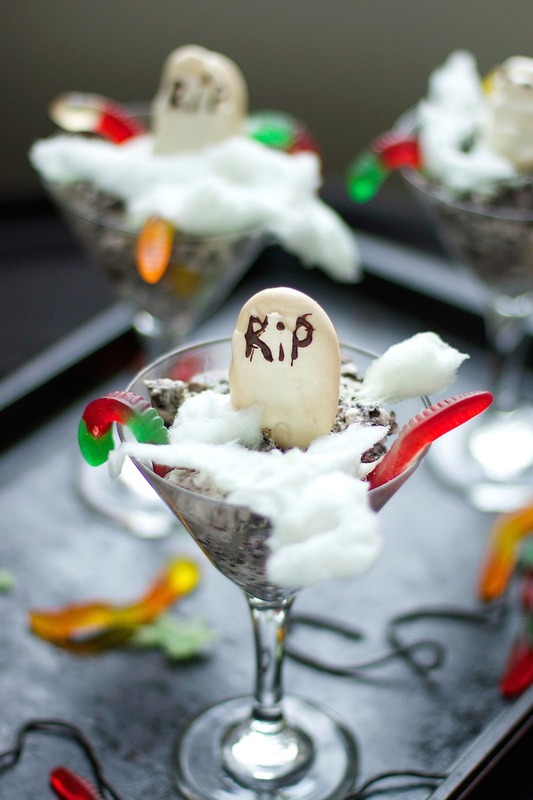 I really like using martini glasses as it allows the "worms" to hang over the edge. 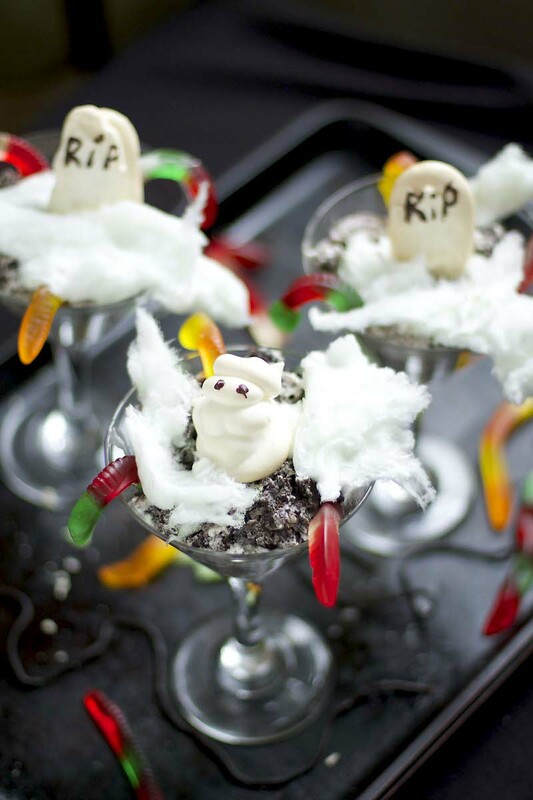 Bury a few gummy worms into each dish, draping them over the edge. Top with cotton candy and a meringue or tombstone ghost. Serve right away. The meringue will soften slightly and the cotton candy will start to "melt" after it sits for a little while. To make the meringue- Preheat the oven to 200 degrees and line a baking sheet with parchment paper. Beat together 3 egg whites in a stand mixer (or in a large bowl with a mixer) on medium-high speed until frothy. Add in 1/2 cup of white sugar and increase the speed to high. Beat until stiff peaks form, about 5 to 6 minutes. Transfer the egg whites to a pastry bag fitted with a large round tip. Pipe large swirls and tombstone shapes onto the baking sheet. Bake until dry, about 1 hour. Turn the oven off and let the meringue cool, in the oven, completely (you can even leave them in there overnight). To make the eyes and RIP lettering, melt a few chocolate chips in a microwave safe bowl. I did a little less than 1/4 cup of chips, which was more than enough. Microwave the chips until they are melted. Using a toothpick, gently dot eyes onto the ghosts and spell out RIP. FYI, it looks better if it's a little messy.